Bactrocera-Block - Kenya Biologics Ltd.
Fruit flies are very mobile; it is therefore difficult to control fruit flies by spraying conventional insecticides. Female fruit flies deposit their eggs in healthy fruits. The larvae that emerge in the fruit cause damage to the fruits. By using monitoring devices it is possible to determine which species of fruit flies are present. Monitoring devices lure the fruit flies into a trap which makes it possible to identify the fruit fly. Bactrocera dorsalis (previously Bactrocera invadens) has a distinct T-shape on the abdomen. This T-shape is not present at Bactrocera zonata. Bactrocera-Block is an attract-and-kill bait station for the control of Bactrocera fruit fly species. Bactrocera-Block consists of a 5cm x 5cm wooden block impregnated with the attractant Methyl Eugenol and the contact insecticide Malathion. Bactrocera-Block controls fruit flies such as Bactrocera dorsalis (Oriental Fruit Fly), Bactrocera latifrons (chili fruit fly), and Bactrocera zonata (peach fruit fly). These pests can be found on crops such as cucumber, zucchini, pepper, tomato, avocado and mango. Bactrocera-Block also controls Bactrocera philippinensis, cacuminata, endiandrae, mayi, carambolea, dorsalis and correcta. Once outside its original sealed packaging, the Bactrocera-Block will start releasing its attractants over a period of six weeks. 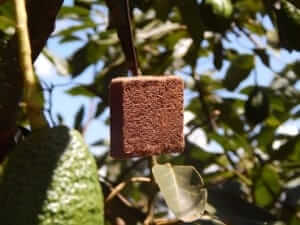 This will attract male fruit flies, which will then touch the block and die from the contact insecticide. Bactrocera-Block is a pesticide. Personal Protective Equipment such as rubber or latex gloves should be used when handling Bactrocera-Block. Store the Bactrocera-Block in its tightly closed original packaging in a cool, dry and dark place. Shelf life of Bactrocera-Block is 12 months from date of manufacture. Store pesticides always out of reach of children.